I use a product called Liquin Original regularly and mention it quite often in my blogs. After a few questions from my readers I realized some people don’t know what it is or how I use it. Liquin is a non-yellowing medium for thinning oil and alkyd paint. 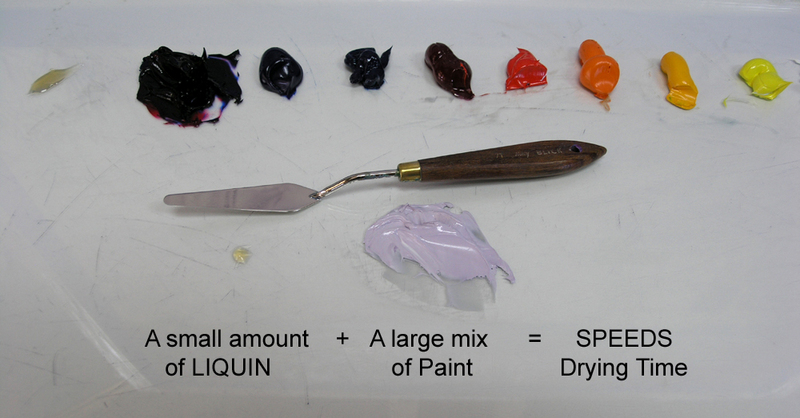 Manufactured by Winsor Newton, Liquin also speeds up drying time. Liquin Original approximately cuts the drying time of oil colors in half, depending on climate, the colors used, and amount of Liquin you add to the paint. I place the Liquin to the left of my colors on our Double Primary Palette. To learn more about the Double Primary Palette we use just CLICK HERE. 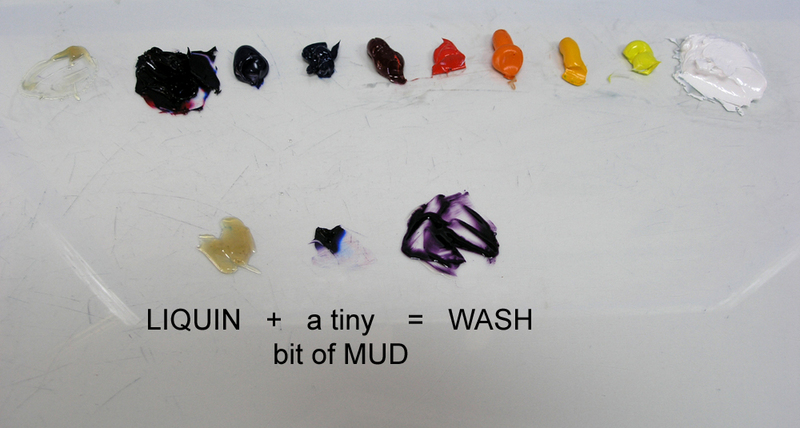 When talking about making a wash of a color I use the Liquin in the proportion shown above. A Lot of Liquin and a tiny bit of paint. In this case I’m using MUD (Ultramarine Blue + Alizarin Crimson) mixed with the Liquin. 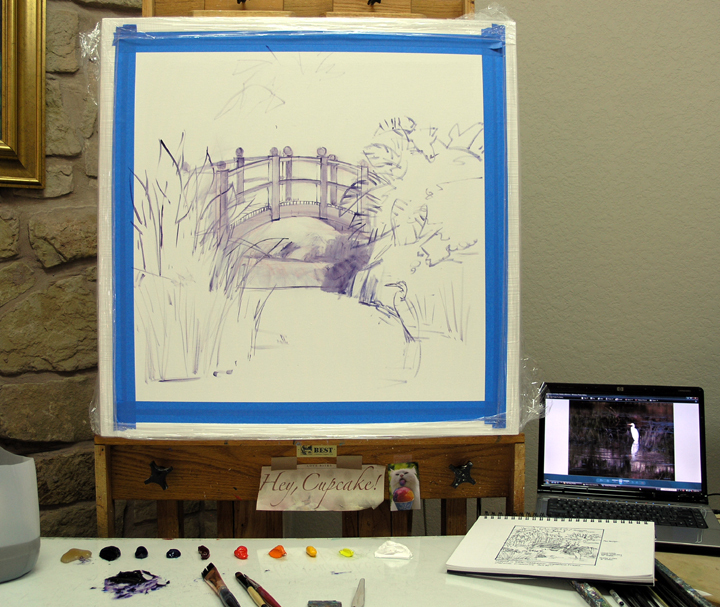 This is the basic wash used for drawing my sketch on the canvas. A wash can be made of any color. The transparent ones work best, MUD, Ultramarine Blue, Pthalo Blue and Alizarin Crimson. Just make sure to mix the paint into the Liquin very well. You want your wash to be smooth without any chunks of color. In the image above the basic elements of the painting are drawn with a brush dipped in the MUD wash. The chili ristras are washed in with Alizarin Crimson + Liquin. 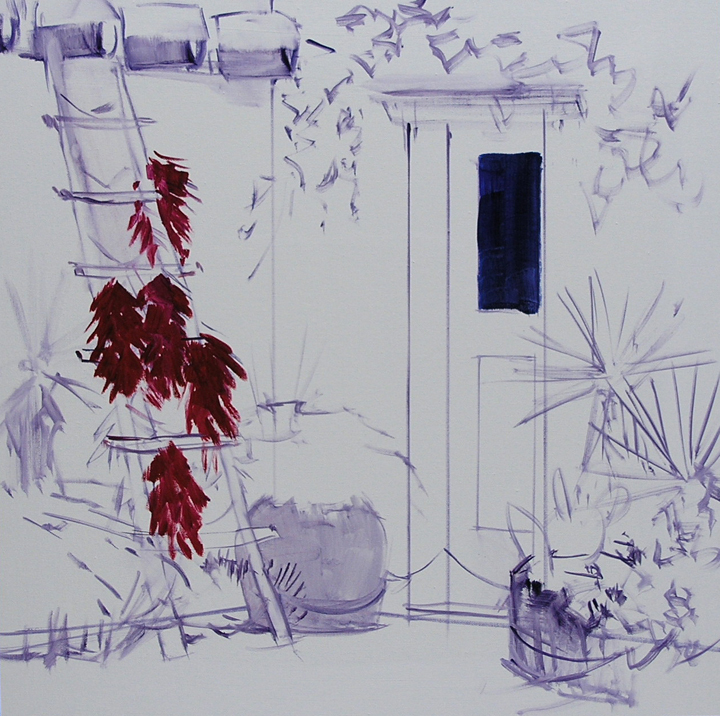 Two washes are used for the window area in the door, Ultramarine Blue + Liquin and MUD + Liquin. To subscribe to my blog and receive notifications of new posts by email just go to the upper right side of this page. You will see a heading EMAIL SUBSCRIPTIONS. Just enter your email address and click the button, it’s easy. Well, we got there and looked at the kittens and cats, all shapes, colors and sizes. There were a lot that needed a new home. Then the girl working there said, “Come see these two, they’ve been here a really long time. The previous owner could no longer take care of them, but she stipulated they had to be adopted together because they are sisters. 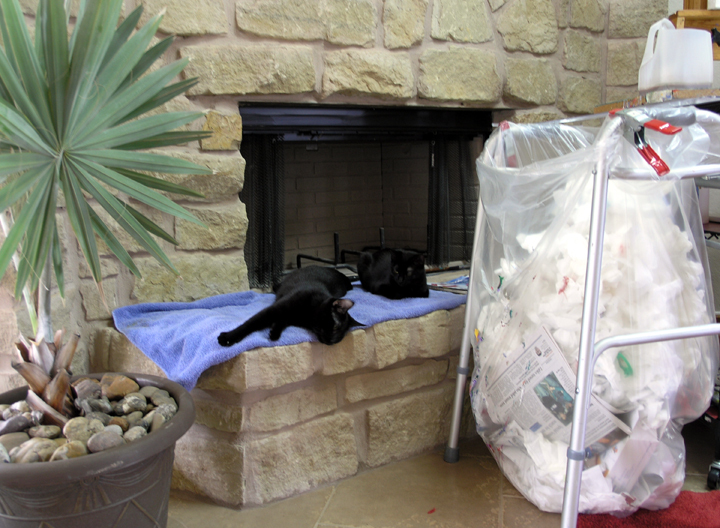 They are house trained and very well-behaved.” Jack and I looked at each other, saying in unison, “TWO?” We got to the enclosure and saw two totally black cats, one a little smaller than the other. “Come inside and meet them,” the young lady said. We reluctantly entered. They came up, sweetly purring and rubbing against us. Jack took one look and said, “Oh no, Double Trouble!” Needless to say we are now a two cat family. The larger sister was named Molly, she is on the left above. The smallest was Junebug. We felt it just didn’t quite fit her so we renamed her “Little Sissie”, for the littlest sister. So the newest members of the family are Miss Molly and Little Sissie. A few posts ago I included a link for Jack’s article, “Line in the Sand“, published by Fine Art Studio Online. CLICK HERE if you missed it. We received many requests for more of his articles, so I’ve included another today. But before I get to “What is a Professional Artist?” I want to share a little of our spring with you. 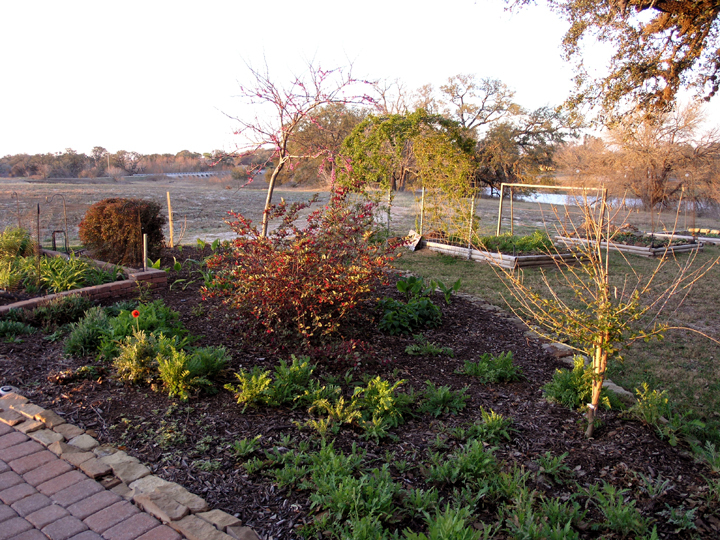 The Red Corn Poppies and Arizona Sun Gallardia are just beginning to bloom in the picture above. 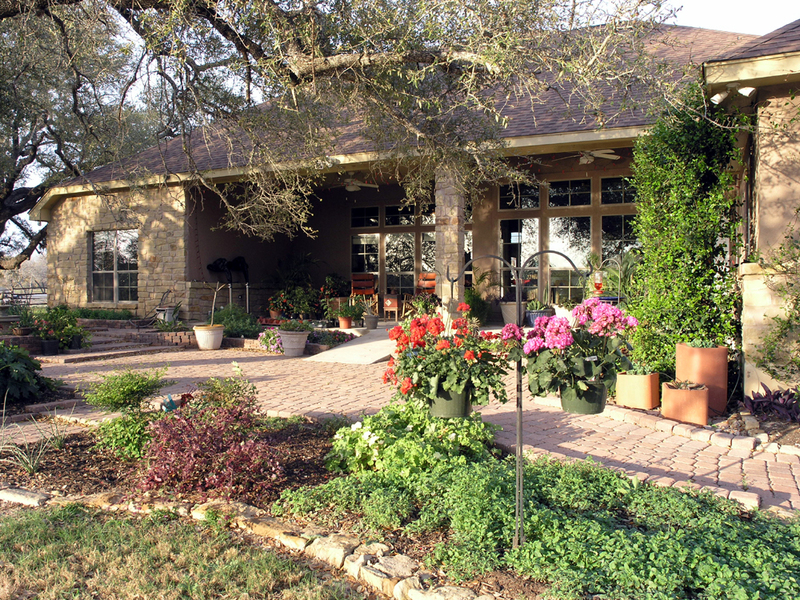 The deep purple plant behind them is a loropetalum bush. It has just finished blooming in hot pink, fringy flowers that look like chenille. Jack surprised me with the Geraniums on the shepherd’s hooks. What a bright spot of color they add to our back patio. Now, back to the question, What is a Professional Artist? This is one of Jack’s recent articles for Professional Artist Magazine (formerly Art Calendar). When I received Kim Hall’s letter informing me of Art Calendar’s name change my thoughts were, “it’s about time“. The new title Professional Artist also brought to my attention two questions. What is a professional artist? And what is expected of us? I’ll answer with another series of questions. What is a professional nurse? What is a professional police person? What is a professional athlete? What is a professional doctor? A recent example. My nephrologist had been on call for twenty-four hours with no sleep. At about hour 36 with no sleep I saw him for my monthly checkup. He went over my vital numbers as if he had been on a two-week vacation. He is a professional doing great work even though he was tuckered out. The poor guy’s face was drawn and eyelids drooped, yet he performed excellent service. A professional nurse is a person who accepts payment for their services to assist in healing. It has nothing to do with how much the nurse is paid, or the number of degrees they earned. A professional police person can be a first day rookie, who has yet to write a ticket or make an arrest or they can be the Chief of Police. When the police person is sworn in, he or she is titled a professional, because they will be paid. An athlete can be considered a professional if he is playing weekend baseball for $50 a game. Or perhaps plays in a lesser basketball league where he is paid peanuts, not thirty-five million a year like LaBron James. A doctor is a doctor when he gets his license. He doesn’t have to wait till he is an accomplished open heart surgeon to use the title. Remember this, a professional is not called that because of what they earn for their services, it’s only because they receive any amount of money for what they do. Let’s fast forward to artists. I detest the titles amateur artist, emerging artist, starving artist, beginning artist and struggling to become an artist. Fellow artists, you don’t want an emerging or beginning cop to answer your 911 call. You want a professional to show up for your protection. My argument has always been the moment you sell grandmother your first painting for $5 you have become a professional artist. There is NO difference between those artists selling $1,000 a year and G. Harvey, who sold his last commission for 1 million dollars. You are both professionals, only G. Harvey has figured out how to sell his work for a tad more. What do I consider the tenants of being a professional artist? What is the charge of the occupant of the name? 1. A professional artist will freely share all information they have learned with those lacking in knowledge. Those who hoard their knowledge are not fit to be called professional. I call them knowledge hogs. As we share what we’ve learned we have additional room to learn more. None of us got where we are independently without the help of others. I helped a 85-year-old sign painter when I was in college. I used what I learned from him about gold leaf to invent an art process that earned me several million dollars. Without what he taught me I never would have invented a unique form of art. 2. A professional artist will conduct themselves with honesty and honor at all times. We, who by good fortune have reached some financial success, must never forget where we started. I sold my first painting for $10. Mikki made out much better, I sold her first painting for $200 in a frame that cost her $160. 4. 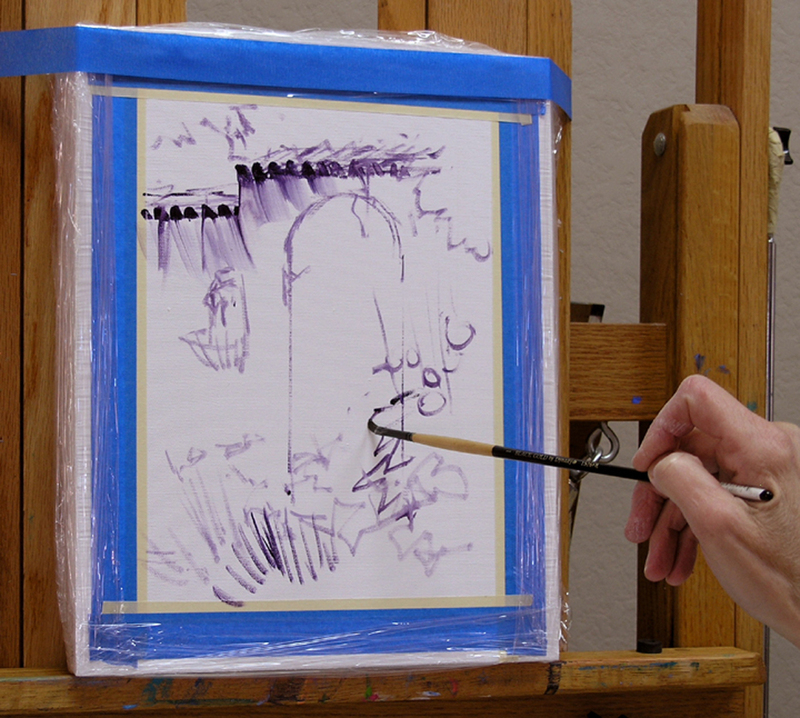 A professional artist learns to step to the easel whether their spirits or down or they are sky-high and produce consistent work. We get up and go to work. Some days we may not be “in the mood”, but we still paint/sculpt. Suddenly, as if by magic, we are filled with inspiration. When we lived on the Big Island of Hawaii, Mikki and I met a group of artists who invited us to go to the volcano. I asked, “Why?” They shocked us. “We are going to sit by the lava flow and get inspiration to paint.” I’m sure they could tell by our faces we were confused. A guy with a pig tail asked, “Where do you get your inspiration? Mikki smiled and answered, “FedEx!” She stunned them. “What?” Mikki followed up, “We get our bills from the mainland twice a month in a FedEx envelope. Seeing bills we have to pay gets us inspired. 5. A professional artist keeps his/her word. Lying has no place in the life of a professional artist. A pro is never late on a deadline. Most of us have worked all night to finish a piece for a client. 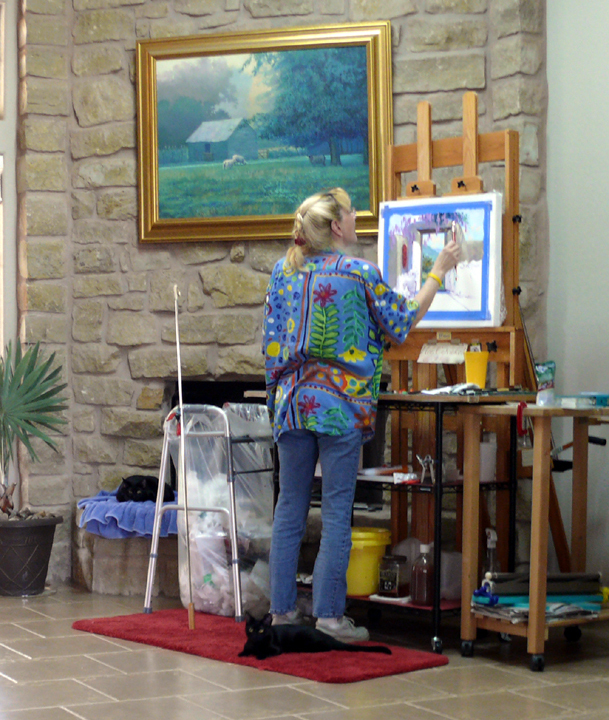 A professional artist communicates with their client and gallery. Misunderstandings occur when we fail to converse. A pro paints/sculpts what the client desires, not what the artist thinks is great. This is true if you expect to earn a living making and selling art. Now that you know you are a professional artist, assume the role. Talk professional, joke like a pro, laugh like a pro and deliver what you promise like a pro. A pro goes by two rules. A. The client is always right. Jack and I appreciate all of you and the comments you make. Thank you for visiting our studio and have a wonderful day. If you’ve been following my blog very long you know about Slinky, our wild kitty. Last October he appeared. Thin, scrawny and very wary. It took a few days to coax him close enough to eat. But we were finally adopted. Slinky became part of our family. He would peer in our studio window or sit on the sill in the office watching us. But if you opened the door he would not come closer than 8 feet. I would see him “Slink” from bush to bush as I worked in the garden. When Jack went for his walk Slinky would climb the tree in the front yard, watching his progress up and down the road. 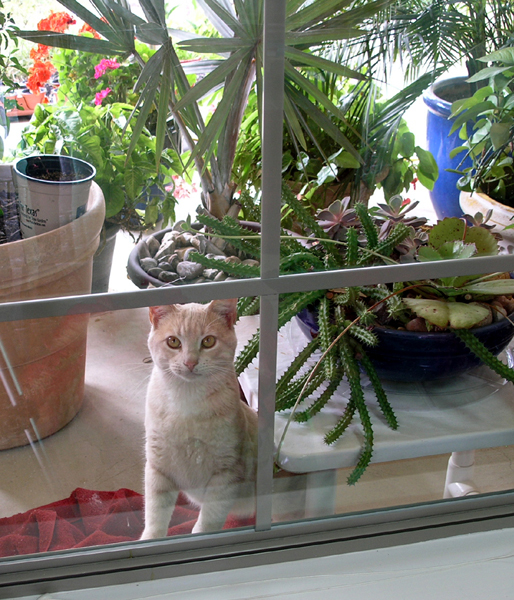 When we sat on the back porch for our afternoon snack he would hide in the bushes by the fountain keeping on eye on us. One day I made the mistake of mentioning we needed to get him neutered. I swear he understood what I said. Even with chicken, his favorite, we could never entice him into the Humane Cage from the vet’s. Well, he began to prowl. But he would always show up in the morning for breakfast and then later for dinner. 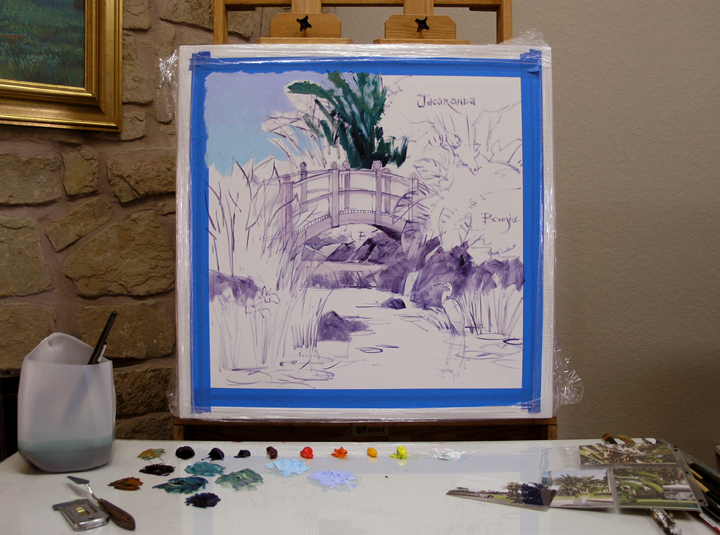 My four mixtures for the water are on the right of the palette. They begin with Ultramarine Blue + a touch of MUD + a bit of White for the dark. Then Pthalo Blue + White and Ultramarine Blue + White. The lightest mix is Pthalo Blue + a touch of Hansa Lemon Yellow + White. To learn more about our Double Primary Palette click Here. The water is painted first. 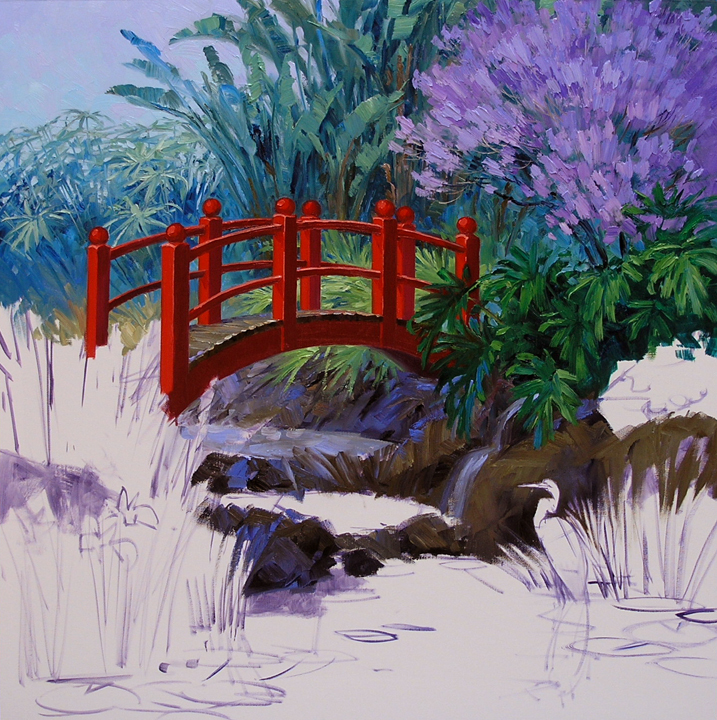 The darkest values go under the rocks and foliage, reserving the lighter, brighter ones for the water in the foreground. Blank spots are left where the water lilies will go. When the water area is covered I go back in to add the reflections. 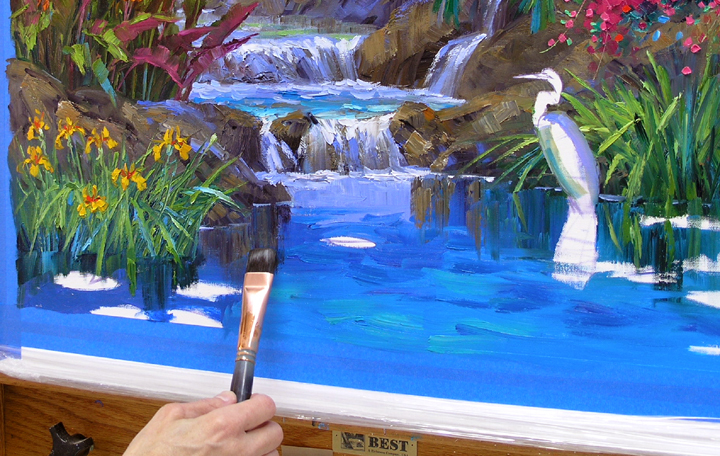 Using the large bright brush I drag the rock color straight down. 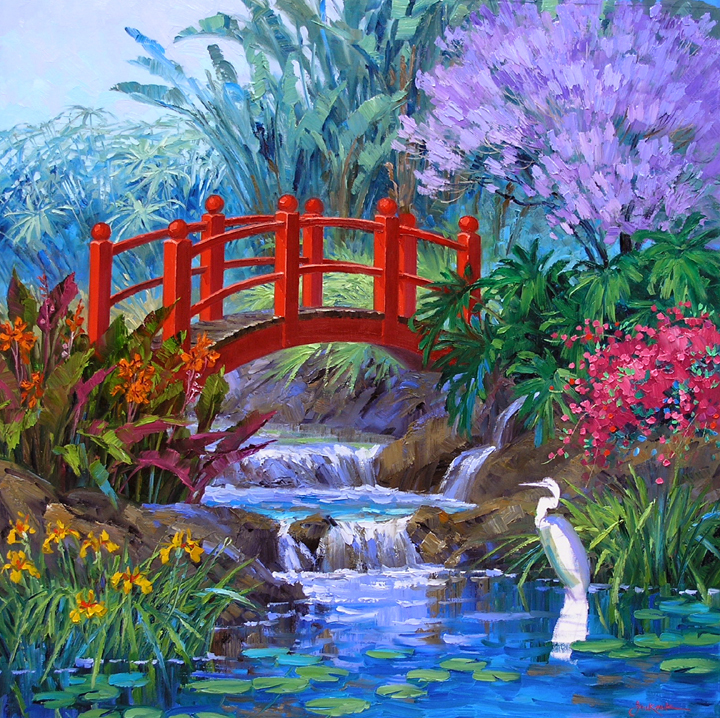 The same is done with the greens of the foliage and the soft blue of the falling water. Next time you are near a lake or pond observe the edge of the water. Light catches the foam from the waterfall and the little stuff that collects there. To indicate this I use a bit of Ultramarine Blue + White and make a broken line along the edge. You don’t want this line to be solid, but just an indication here and there. 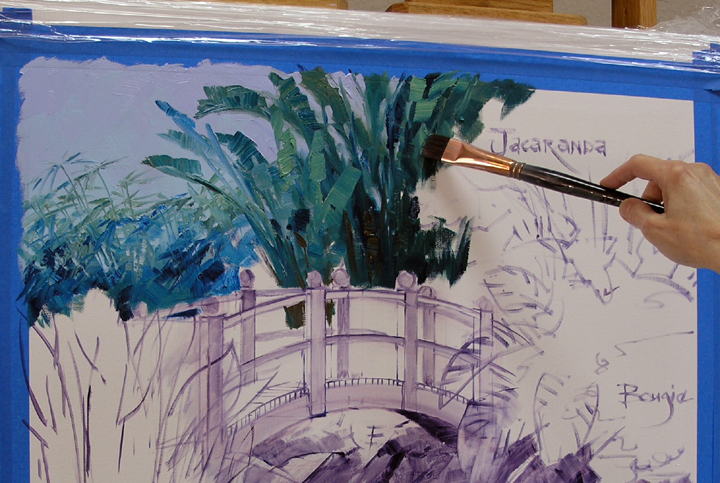 With a clean brush I make a few horizontal strokes across the wet paint of the water. Not many, you can see them to the left of the Great White Egret. This makes the water surface appear flat. 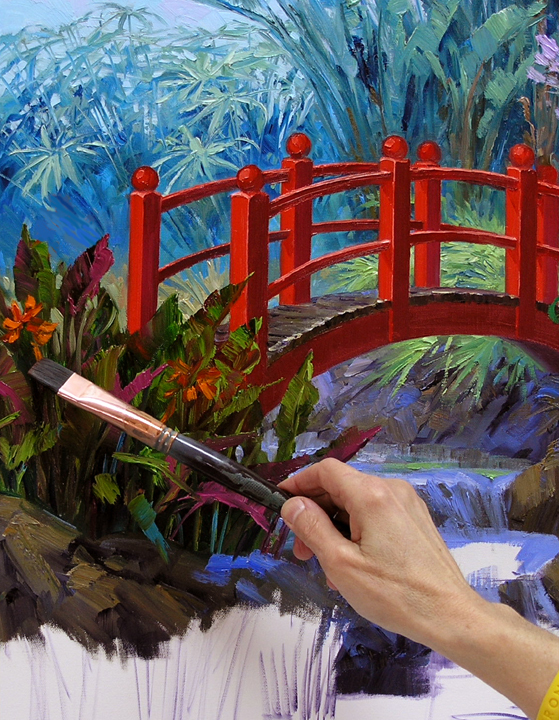 Now the water lilies are painted using greens saved from the rest of the painting. In the picture of my palette at the top of the blog you can see all the extra paint piled on the left. Now for Clicker Bobbie! Taking White I add a little of the purple remaining from the Jacaranda Tree. Another mix is made of White + some of the green from the palms behind the bridge. These make some beautiful shadow colors for the Great White Egret. Pure White is used for the highlights. 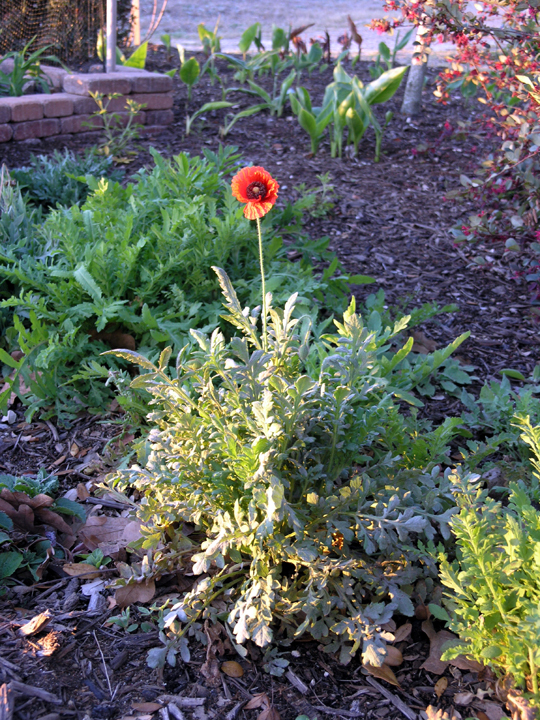 Saw our first Corn Poppy of the spring this morning, YIPPEE! You can see the tops of the Canna Lilies popping up behind them. The Redbud Tree, in the center above, is just beginning to pop out in its pink blooms. The Loropetalum Bush below it is already covered in chenille-like hot pink flowers. Peggy Martin Roses climb the arched trellis in the background. 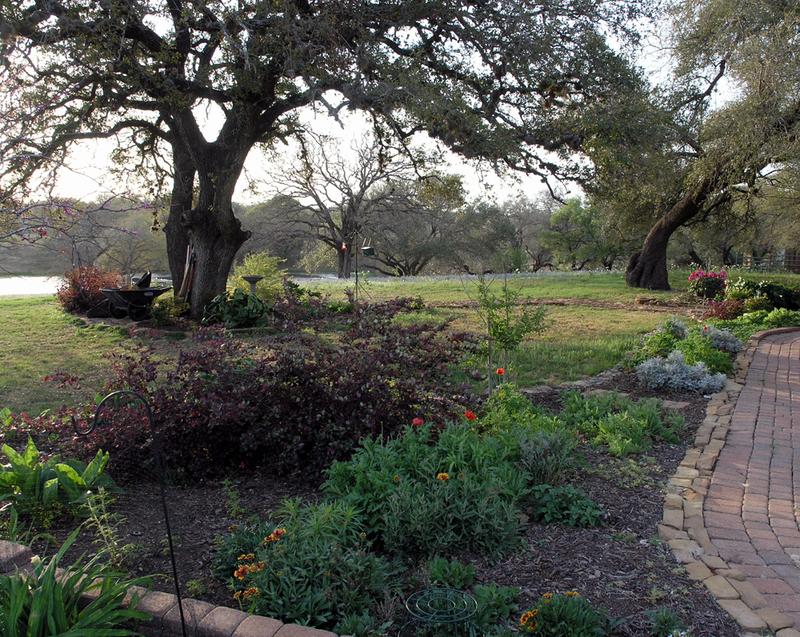 The small tree to the right is Almond Verbena, which has the most fragrant white blossoms in the summer. In another couple of weeks this bed will be covered in Red Poppies. I absolutely love spring. To enlarge any of these pictures just click on the image. Since our Canna Lilies are just peeking out of the soil, I have to go to our reference file for my models. 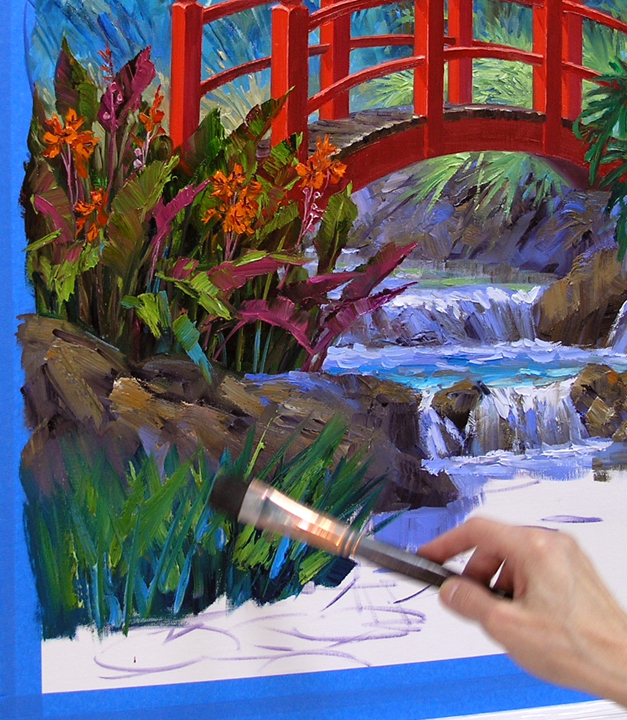 Using the edge of a large, bright brush the broad colorful foliage is blocked in. 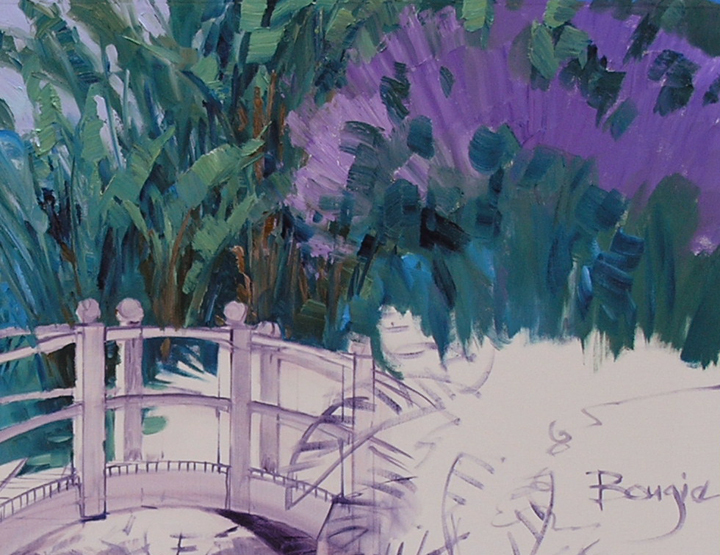 I use greens mixed from various proportions of Ultramarine Blue + Hansa Lemon Yellow. A few leaves of Alizarin Crimson are brushed in to add variety. 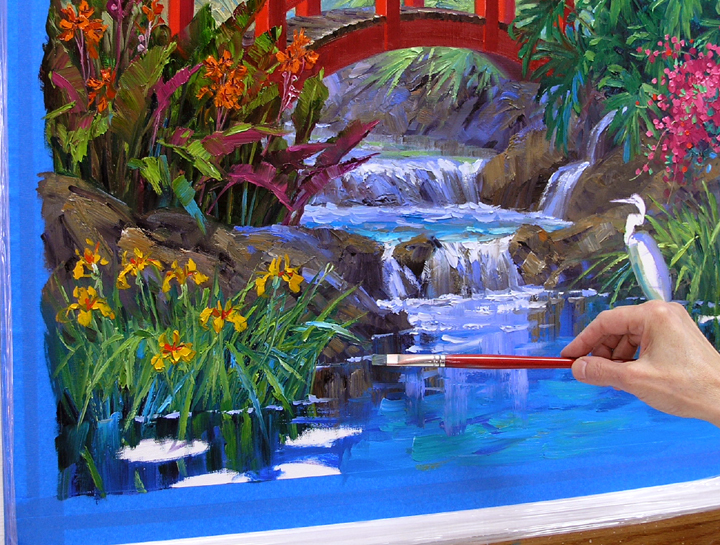 When painting waterfalls I’ve learned to block in the rocks first. Then I pull the water over the rocks. This picks up some of the color underneath, making the upright plane darker. The flat surface of the water is lighter because of the sky reflecting down on it. Moving back to the Canna Lilies the orange blossoms are painted with the corner of the same brush used for the leaves. 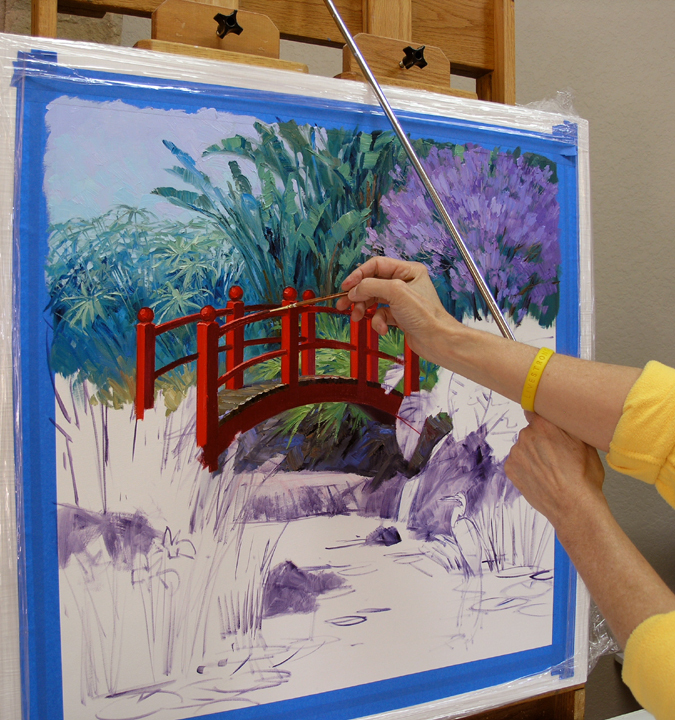 A mix of Cadmium Orange + Alizarin Crimson is used to block in the flowers first. Then I come back with pure Cadmium Orange for the highlights. The straplike leaves of the Iris are painted with the same brush as the Canna Lilies. It’s amazing the wide array of brush strokes you can make with one brush. Today was a big day for us, we sent Jack’s newest book to be edited. He has been working the last two years writing Sea to Shining Sea: The Mexican American War and the Manifest Destiny. It’s the sequel to Ten Years in Texas, Jack’s first historical novel (shown on the left). Ten Years in Texas covers the ten years Texas was a Republic, after winning independence from Mexico and before being admitted into the United States. Jack named the main character after his best friend in high school, Bud Miller. Bud grows from a boy of 16 into a proud, young man during this exciting time, interacting with many of the major players in Texas History. We’ve had several former Texas legislators tell us it’s one of the best they’ve read on this period of time in our State’s colorful past. If you are interested in ordering Ten Years in Texas just click here. 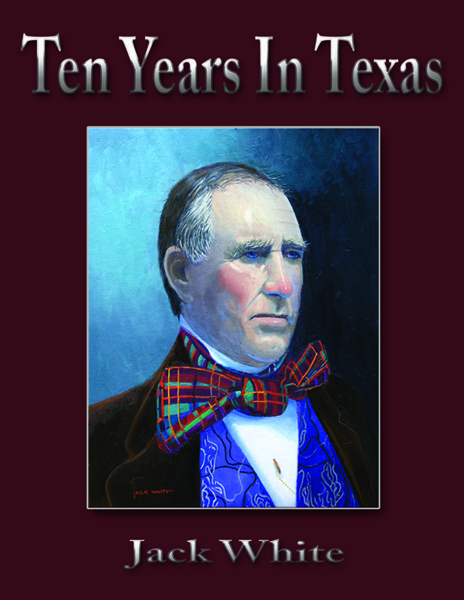 And, Jack did the painting of Sam Houston on the cover. I’m so proud of him! Now for the red bridge. The darkest reds in the shadows are Cadmium Red Deep + a bit of Alizarin Crimson, while Cadmium Red Light is used for the red in the sun. This piece was planned with a lot of green so the red bridge would glow. Red and Green are complimentary colors, across from each other on the color wheel. Juxtaposing them makes the red appear even more intense. 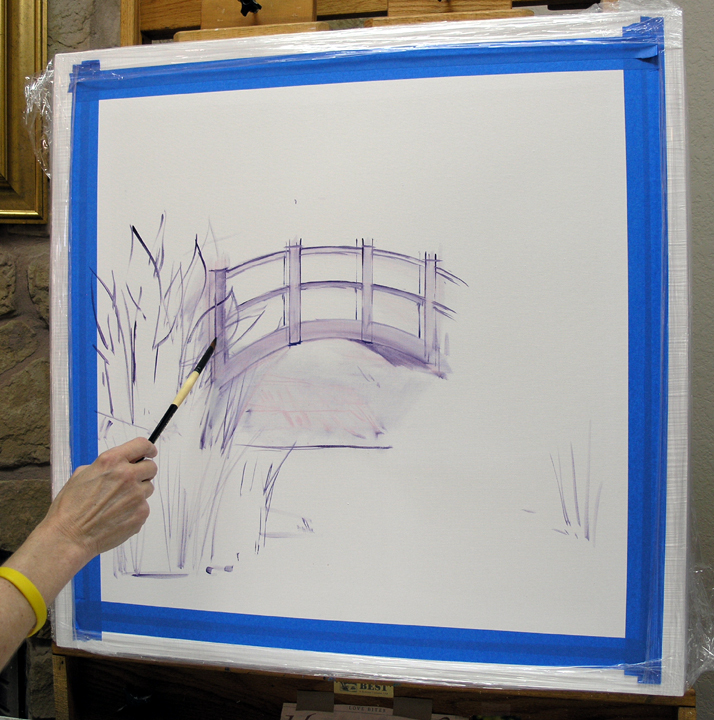 Using the mahl stick to brace my hand the final details are drawn with a fine, liner brush. To find out more about how a mahl stick is used just click here. 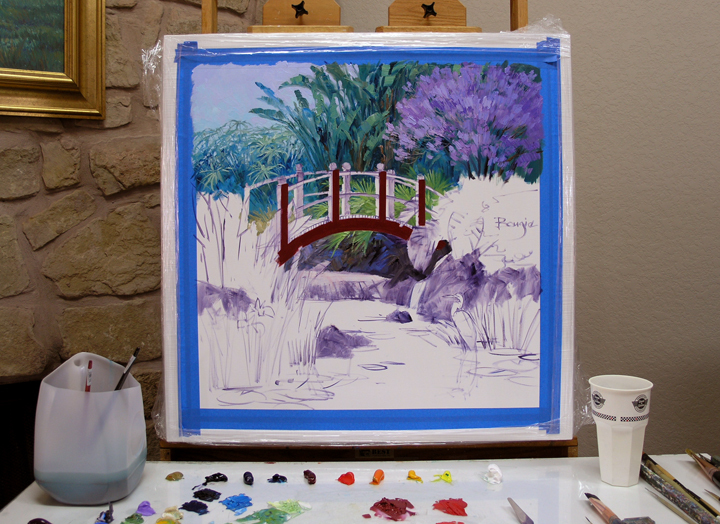 The mixes for the sky and background foliage are out on the palette. 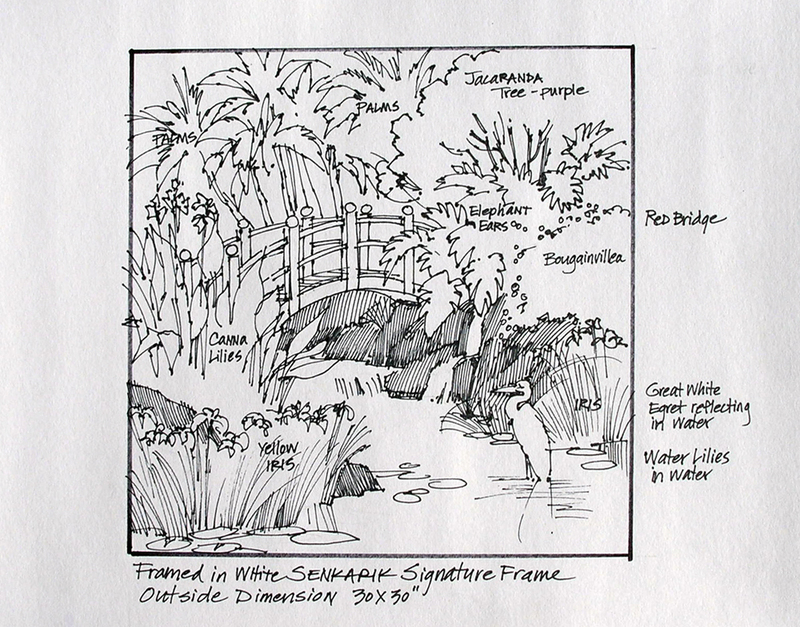 The sky will be very simple to counterbalance the complex variety of plants in this piece. 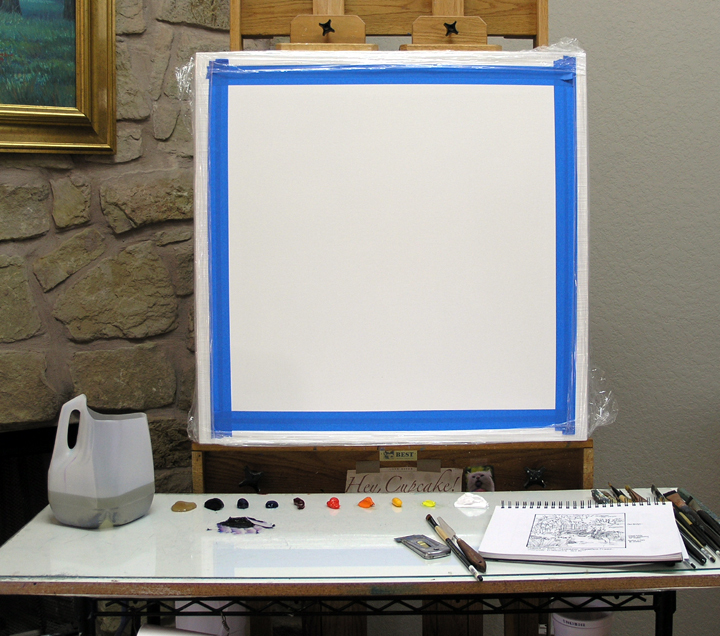 Two mixtures are used for the sky, Ultramarine Blue + White and Pthalo Blue + White. The greens are varying proportions of Ultramarine Blue + Hansa Lemon Yellow + White. The White dulls and cools the green so it will fall into the distance. 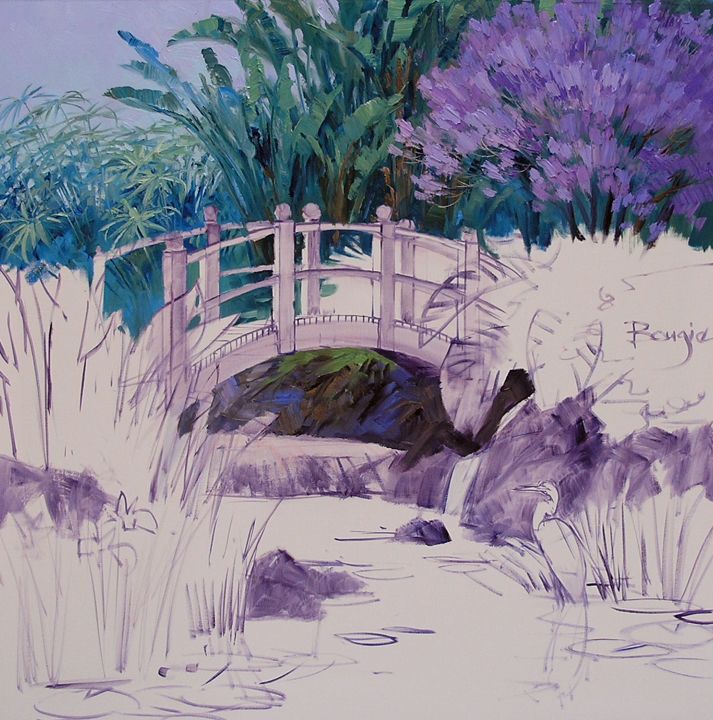 Painting is like life….. you make adjustments as you go along. 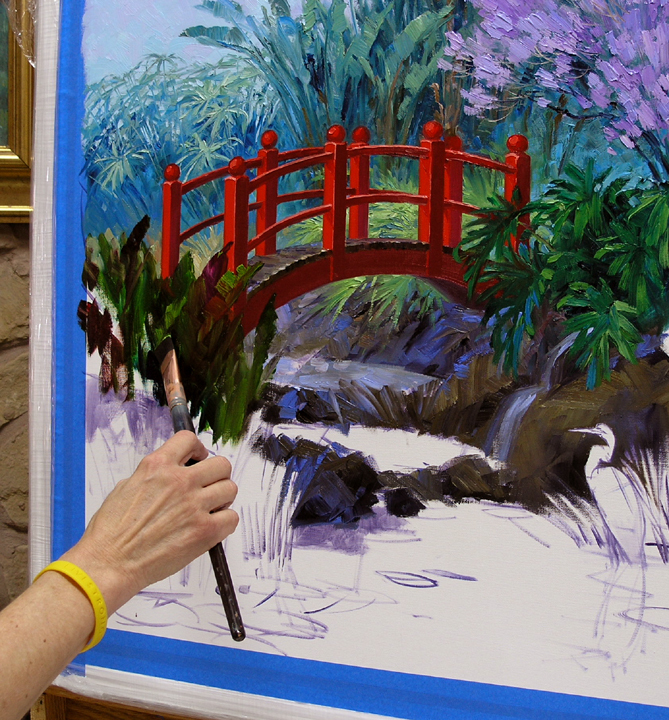 When I walked to the easel this morning I decided to add some Umbrella Sedge to the left corner behind the bridge. Their leaf is very similar to Bamboo and will carry the motif from the wallpaper into the painting. The shapes of the Giant Birds of Paradise are a wonderful complement to the Umbrella Sedge. 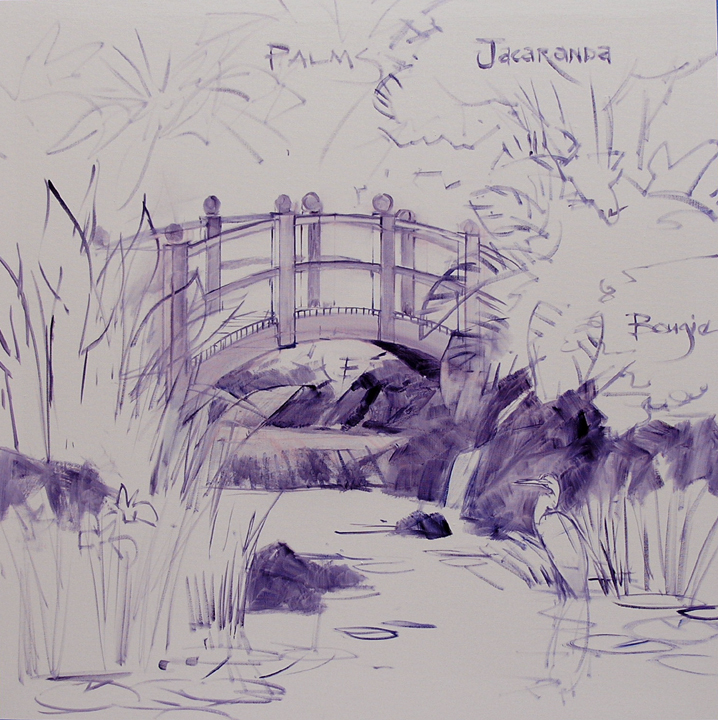 A Jacaranda Tree fills out the upper right corner. We initially became aware of these beautiful purple-blue trees on the island of Maui when we lived there in 1993. On our first trip upcountry they were all in full bloom. I was in awe, having never seen anything like it. They glowed in the evening sun and the fallen petals carpeted the ground underneath. It was like being in another world, a memory as clear as if it were yesterday. 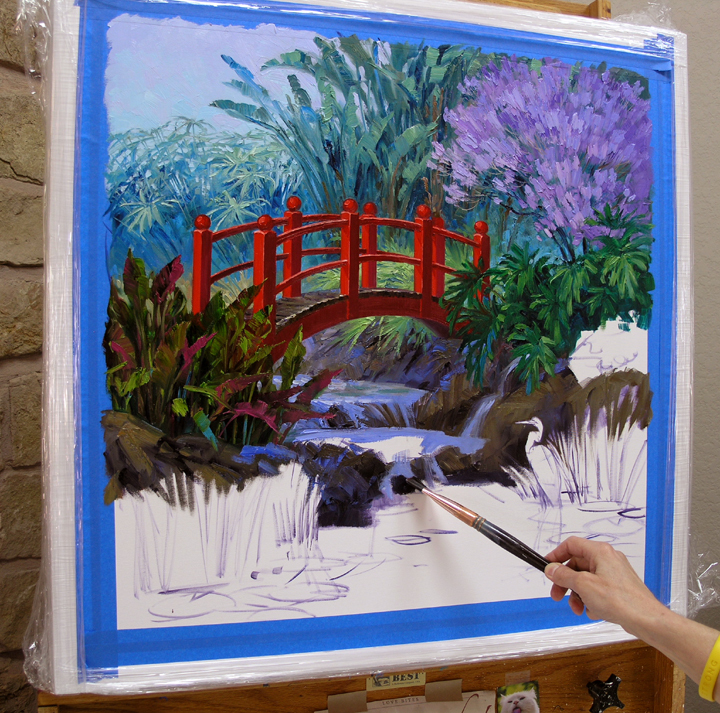 The first step is to establish the mass of foliage in the left corner. This helps me in the placement of the bridge. 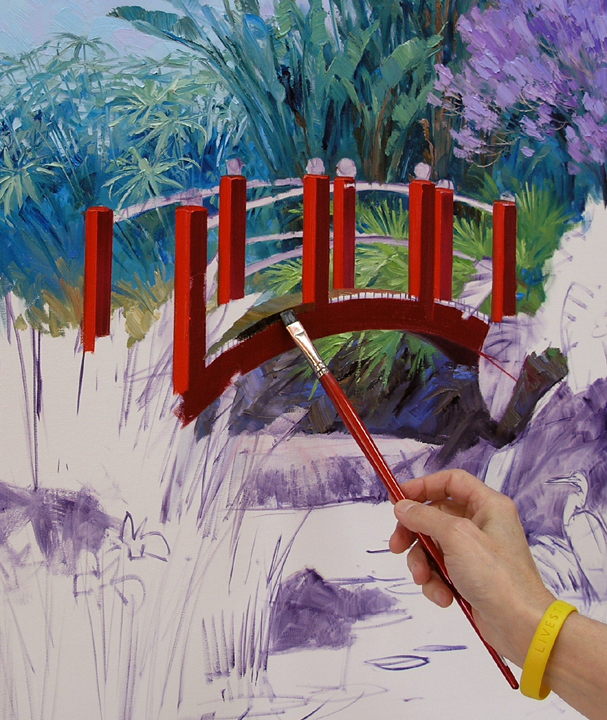 The basic curves of the bridge and railing are drawn with a brush dipped in a mixture of MUD (Ultramarine Blue + Alizarin Crimson) + Liquin. 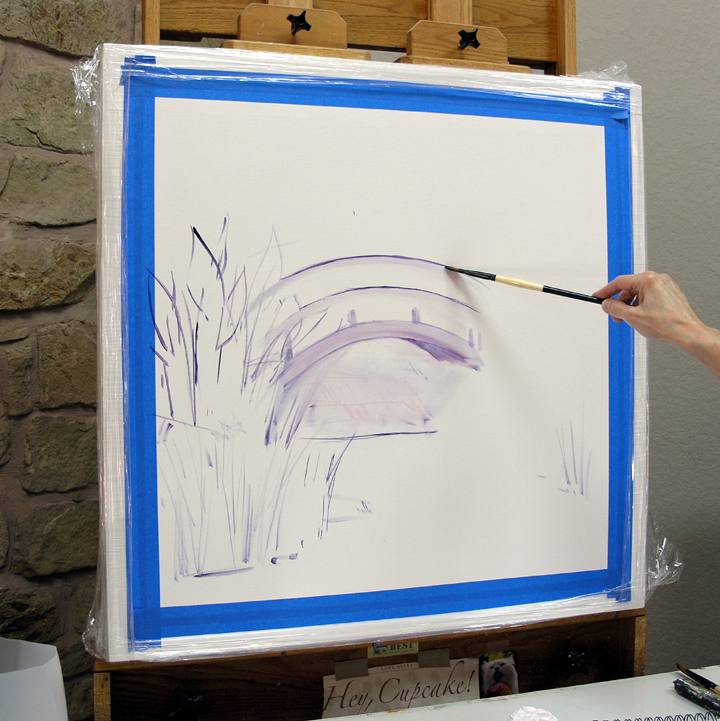 The uprights on the bridge are drawn next. 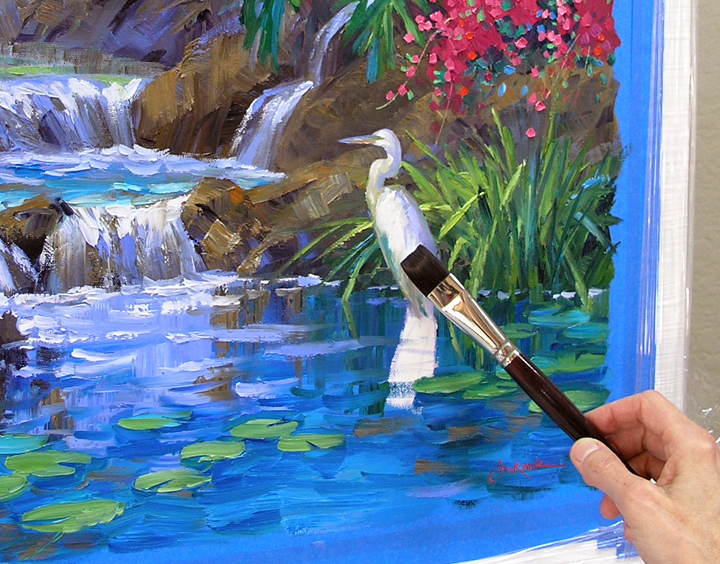 After the bridge and the block of foliage on the right are complete, my attention turns to positioning the Great White Egret on the canvas. I’m using “Clicker Bobbie”, our resident egret on Senkarik Pond, as my model. PS. If you would like to be notified by email when I make posts to this blog just scroll up to the top right of this page. Go to Email Subscription, enter your email address and click: Sign Me Up! In our conversation I asked where the painting would go. 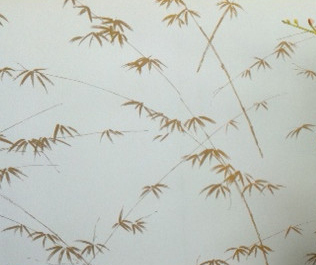 Terry said she wanted a piece to hang in a guest bathroom that has a bamboo motif wallpaper. After visiting for awhile I suggested two ideas. 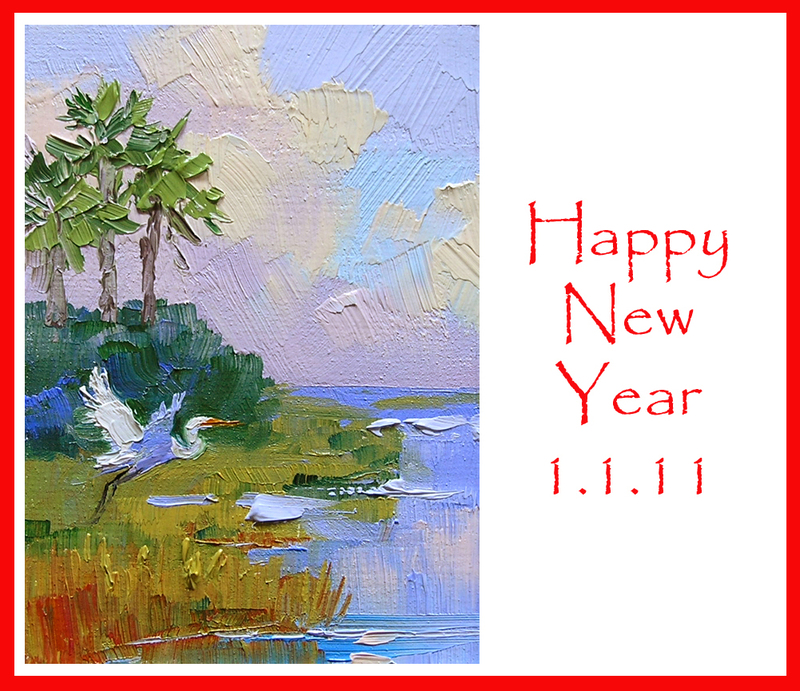 The sketch below shows the design based on our New Year’s card. 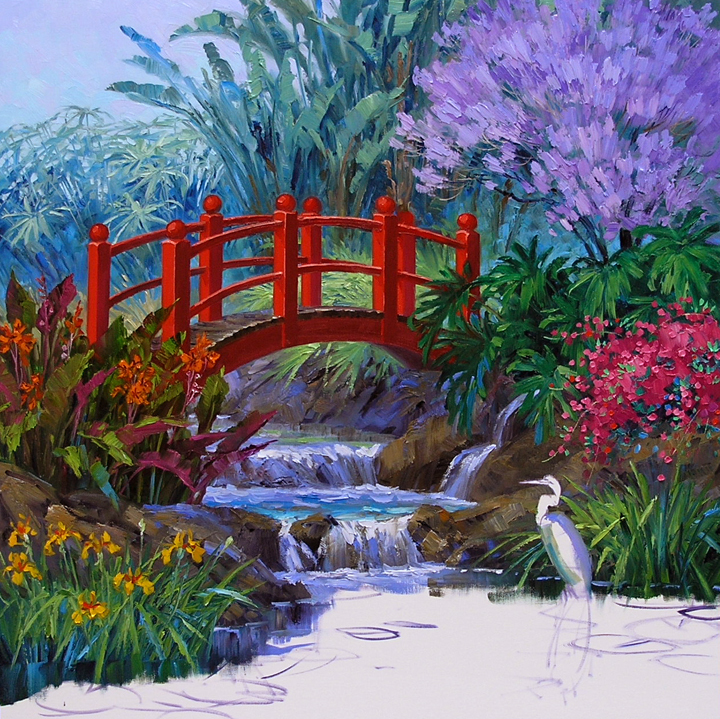 This piece would be located in the Florida Everglades. 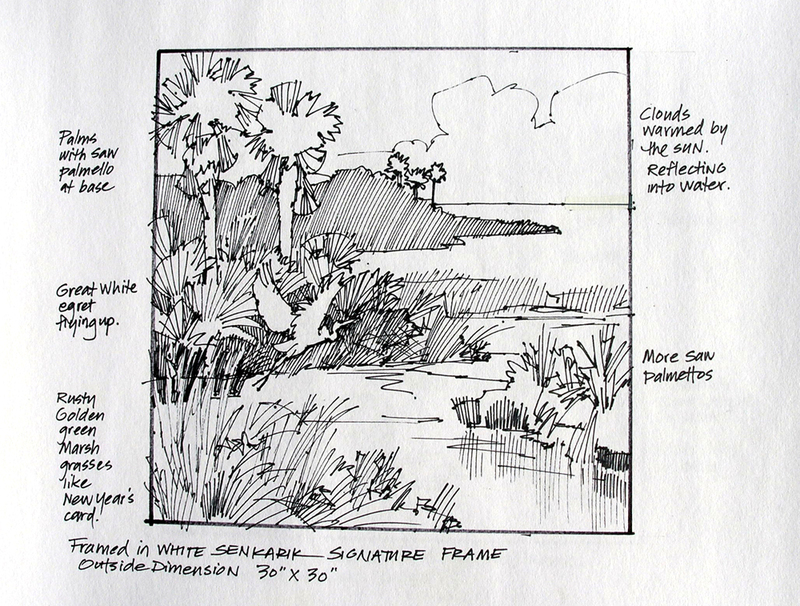 Marsh, palms and saw palmetto would provide a gold, rust and green color scheme. UPDATE! 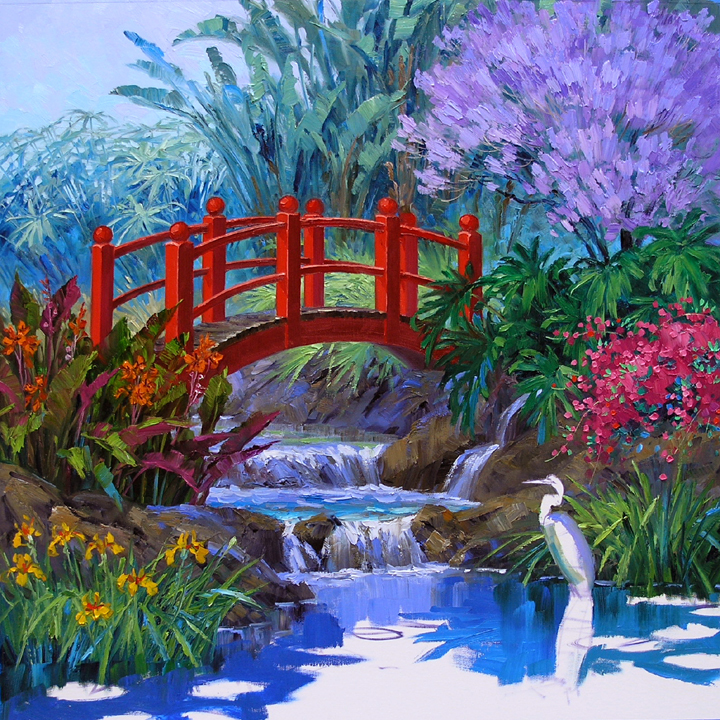 Our collector who won A Little Bit of Paradise is going to give it to her mother for her 90th birthday. Isn’t that cool? We have the world’s nicest collectors.